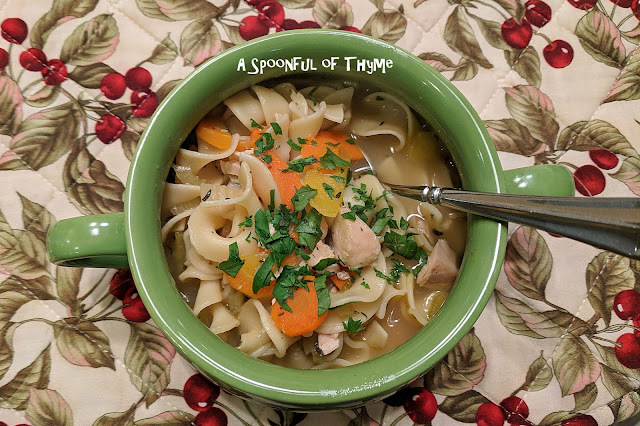 Today is Saturday Soup Swappers and I was challenged to make something that would warm us up on a cold and snowy day. Today's theme was selected by Sue at Palatable Passtime. Thank you, Sue, for stretching my memory... This was quite a challenge as snow is only a memory for me...the last time it snowed here was January 25, 1999! That was an exciting day as it wasn't just a dusting of snow, it was six inches in some places. Most folks were told to stay home and not go to work. I know school was cancelled...we don't have anything that looks like a snowplow and our streets were filled with children, snowmen, and if you lived near a hill, there were sleds and skis everywhere! What did I cook? I have absolutely no idea! I do know that I sat outside with a cup of tea and watched as it continued to snow and snow and snow. I loved every minute!! Back to today. Well, I feel fortunate if we have rain. I was facing a challenge, though. Terry had a surprise issue with his knee the first week of December. He was in excruciating pain. After multiple trips to doctors....the bad news came. He was facing a knee replacement right after the New Year. Needless to say, he has had no appetite, but, Chicken Noodle Soup sounded comforting. 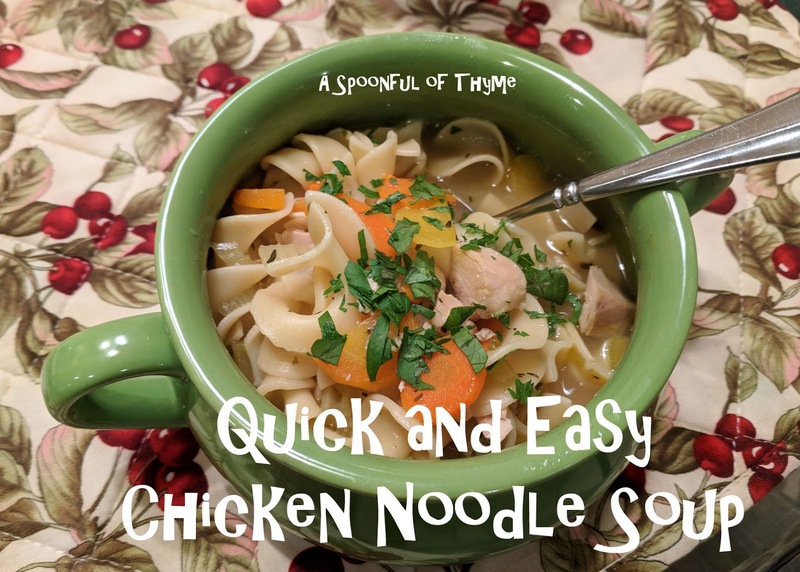 So, I made a very quick and easy Chicken Noodle Soup. 2 cups shredded chicken, a rotisserie chicken works great or cook three chicken thighs and a chicken breast in the oven and shred. In a large Dutch oven, heat the oil over medium high. Add the carrots, celery, onion, bay leaves and thyme and saute for about 5-7 minutes, or until the vegetables begin to soften. Add the garlic and saute another minute or two. Add the chicken stock and bring to a boil. Allow the mixture to gently boil until the vegetables are tender. Add the egg noodles and boil the mixture for about 10 minutes, or until the noodles are soft. If it appears that additional liquid is needed add more stock or a cup of water. Add the chicken and parsley to the mixture and continue to simmer until the chicken is warm. Adjust the seasoning as desired. Ladle the soup into bowls and sprinkle with a bit of parsley, if desired. While Terry was only able to eat about half a cup of soup, he said it really hit the spot. I know I enjoyed it. Who doesn't like a basic chicken noodle soup? If nothing else, it brings back childhood memories! The Saturday Soup Swappers is a group of bloggers brought together by Wendy at A Day in the Life on the Farm. The group gets together on the third Saturday of the month to share soups or stews based on a theme selected by one of the members. If you are interested in joining in on the fun, follow the link above for more information. All are welcome! We are lucky here to have rain at all, but we've had a week of it, which we needed so much. Your soup sounds perfect for a rainy day! Chicken soup is always soothing, whether you are fighting the weather, an illness or a surgery. Hope all went well and he is on the mend.